The Maserati GranCabrio is one of the most stunning cars on sale. It’s not perfect, with a tiny boot and thirsty engine, but this is still a hugely desirable four-seat convertible which turns as many heads as a Ferrari. Interested in buying a Maserati GranCabrio? 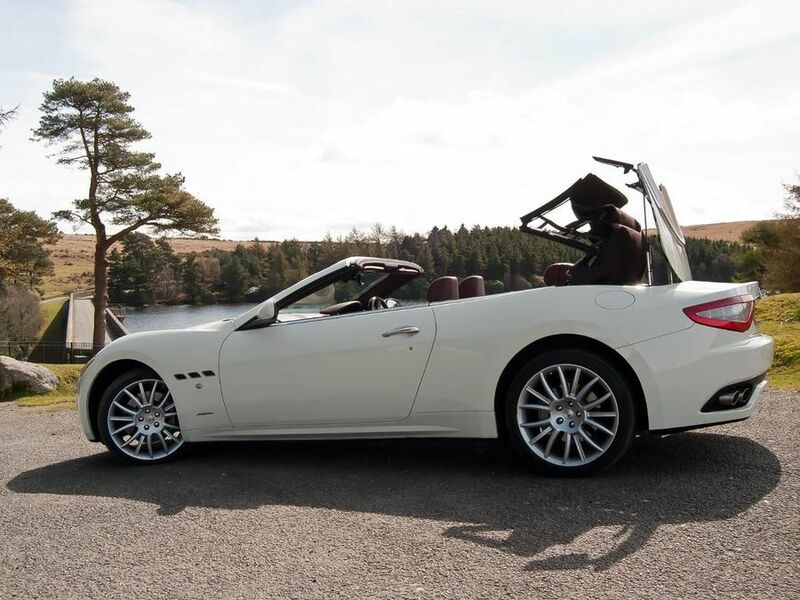 The Maserati GranCabrio is one serious head turner. If you don’t like attention, this isn’t the car for you, especially when it’s painted the pearlescent white of our test car. It’s certainly the most exotic car available for less than £100,000. The drama of the huge grille, wide and low nose and Trident badge could only have been penned in Italy. This is a very long car – but it appears svelte from all angles. There’s a choice of colours for the soft top, giving customers a flexibility to alter the appearance of the GranCabrio quite considerably. The interior isn’t quite as successful as the exterior. There’s no doubting it feels like a special cabin, but some materials, such as those around the anologue clock, are a bit scratchier than you’d expect in such an expensive model. We also found the front seats uncomfortable on longer trips. The wooden trim and steering wheel seems a little out of place in such a modern take on the Maserati formula, but the leather trim is superb, with elegant stitching. This is a true four-seater too, perfectly capable of accommodating four adults. The roof is extremely long, so it’s no surprise it takes a reasonable 28 seconds to close – a task it can complete at speeds under 20mph. Interior space is almost unique, with only the Bentley GTC offering similar space. But, with only 170 litres of boot space you’ll need someone to follow behind with your luggage. Not only is it a tiny boot, it’s also wide and thin, meaning you’re more like to use the rear seats for carrying luggage than people. The GranCabrio has two suspension settings, normal and Sport. Choose the latter and the ride is firm, but the chassis is also more composed in corners. Removing the roof has added some flex into the car, which makes its handling less precise than the GranTurismo coupe it’s based on and less of a competitor to cars like the Porsche 911 Cabriolet and Jaguar XKR. Like the heavyweight Bentley Continental GTC, the GranCabro is capable of covering ground very quickly, but feels more settled at a relaxed pace. The rev-happy 4.7-litre V8 couldn’t be more different from the low-revving surge from the Jaguar V8 and Bentley 6-litre W12. Because of this the Maserati can feel slightly slower than its on-paper statistics suggest. Work it hard though, and the performance is there – with a particularly rousing soundtrack to back up its 440bhp. Zero to 62mph takes around 5.3 seconds. Choose the GranCabrio Sport and you get an extra 10bhp, increasing performance slightly. With average fuel consumption of 19mpg and CO2 emissions of 354g/km, the GranCabrio is as expensive to fuel and tax as the Bentley Continental GTC, despite having around 100bhp less. The Porsche and Jaguar will also be more economical and quicker. But, if you can afford it, seeing the GranCabrio on your driveway will make up for the expense. The Maserati GranTurismo coupe it’s based on has been subject to two manufacturer recalls – one to fix a potential issue with its suspension and one for its seatbelt warning buzzer, which should have been rectified for the launch of the GranCabrio. A three-year warranty is supplied with the vehicle. The GranCabrio is fitted with intelligent airbags which adapt their inflation speed to the crash situation and size of the occupants. Head and chest airbags protect from side airbags and there are pre-tensioners for the seatbelts. Extendable roll bars located behind the rear seats extend in 190 milliseconds should the car turn over. Anti-lock brakes (ABS) and Maserati Stability Programme (MSP) are fitted as standard. There’s a 7-inch screen for the sat-nav, radio and on-board computer, while a 30GB hard drive takes care of storage for music and maps. There’s a USB port in the glovebox and telephone connectivity, which will also read SMS text messages aloud. The Sport model is fitted with an exterior styling kit, which further enhances the car’s looks. There are only a few four-seat convertibles on the market, but that’s not the GranCabrio’s biggest lure. Many owners will undoubtedly buy it just for the way it looks – the fact it’s a good car too being something of a bonus.